Assateague Island is a barrier island located off the coasts of Maryland and Virginia - you can get out to Assateague through either state. The Maryland access is through Assateague Island National Seashore. You can camp there but there are no hotels or beach houses. We provide information on vacation rental options in both Maryland and Virginia. See the two sections provided below. Virginia access to Assateague is by way of Chincoteague Island - another barrier island that sits between Assateague and the Virginia mainland. It's actually a series of steps to get out to Assateague. First you drive across a causeway that connects the mainland to Chincoteague Island. Once you hit the island you're right in the middle of all the hotels, rentals, restaurants, etc. You drive through the Chincoteague Isand resort area and across Chincoteague Inlet to get onto Assateague Island, but you're not quite at the beach yet. First you'll drive through Chincoteague National Wildlife Refuge - a destination in itself and part of the reason people choose to vacation on Chincoteague. Then, once you're through the refuge, you'll get to Assateague Beach. It sounds like a lot of driving but it's all actually pretty compact. It doesn't take all that long to get out to the beach and there's plenty of opportunity to spot ponies, deer, and birds of all types along the way. Four Bedroom Waterfront. Four bedroom, four bath waterfront home with dock. Located on Oyster Bay. Screened porch, large great room with fireplace. 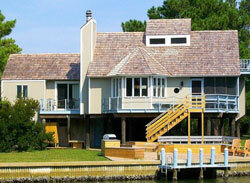 Luxury Waterfront Home with Elevator Five bedroom, four bath home on Chincoteague Channel. Two-story porches with great views. Has convenient elevator access to upper floor. Waterfront Home on Chincoteague Bay This waterfront home has four bedrooms and three baths. It's located on the north end of the island and overlooks Chincoteague Bay. You get great sunset views from this side fo the island. Has both screened in and open porches. Private dock. Main Street Condo. Sunset Hill condo with water views. Located just 1/2 mile for downtown Main Street shops and restaurants. 3 Bedroom Home with Large Screened Porch. Four bikes provided for touring the island. 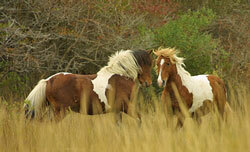 See Additional Chincoteague Island Vacation Rentals There are over 50 to choose from. Since Assateague is a National Seashore, there aren't any vacation rentals right on the beach. There are, however, lots of vacation homes and condos available on Chincoteague. Many of them are waterfront, overlooking Chincoteague Bay or Chincoteague Inlet. Although vacation homes are not available on Asssateague Island, you can camp there. 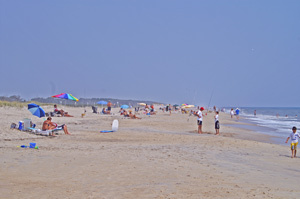 Assateague Island State Park and Assateague Island National Seashore both have camping areas available. Between the two parks, there are a variety of camping options available, including pull-in camper sites (no hook-ups), tent sites, backcountry camping, and horse camping. If you'd like to stay near the Maryland entrance to Assateague Island, there is a community called Assateauge Pointe that has lots of vacation homes available for rent. Community amenities include swimming pools, a fishing pier, and playgrounds. The community is located next to Frontier Town (water park, mini-golf, wild west show, and camping) and about four miles from the bridge to Assateague Island State Park and Assateague Island National Seashore. It's about a 10 minute drive north to Ocean City, Maryland. See Assateague Pointe rentals at HomeAway. Ocean City, Maryland is located just to the north of Assateague Island, and you'll find many vacation rentals available there. 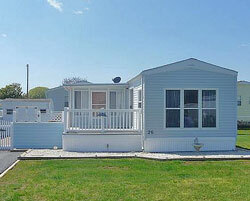 Visit OceanRentalsMD.com for list of rentals in the southern portion of Ocean City, close to the Route 50 Bridge for easier access to Assateague Island. It's about a 15 - 20 minute drive from the Route 50 Bridge to Assateague State Park. These are located in a waterfront community on the Maryland mainland, approximately 4 miles from the bridge to Assateague Island State Park and Assateague Island National Seashore. 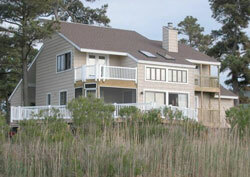 The Assateague Pointe rental rates are very affordable. Assateague Pointe vacation rental for four. Full kitchen, central air conditioning, free wi-fi, washer & dryer. 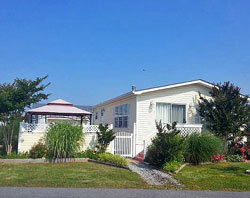 Assateague Pointe 2 Bedroom, Sleeps 6. Full kitchen, washer & dryer, 2 tvs, free wi-fi, central air conditioning. Assateague Pointe, 2 Bedroom. Sleeps six. Assateague Pointe 3 Bedroom. Sleeps 8. No smoking and no pets allowed. Full kitchen, 2 tvs, central air conditioning, washer & dryer. More Assateague Pointe Vacation Home Lsitings. There are many to choose from. Most are similar in design and amenities provided.